For the American people, 1932 was one of the two hardest years of the depression, with over 13 million Americans having lost their jobs since the market crash in 1929. Packard responded to the depression by sticking to its elegant luxury lines for car bodies, but also rolling out a lower-priced model that pretty much looked the same as the pricier Packards, but weighed about 500 pounds less, for about $1,750. The 1932 Packard 904 Deluxe 8 was not one of those budget models. The Model 904 Deluxe 8 was offered in 21 different body styles in 1932, and the 904 was a design developed by Dietrich Inc, and a convertible model was one of the styles available. Deluxe 8 Packards sold for between $3,745 and $7,950. The different styles of 1932 Model 904 Deluxe 8 Packards were produced in limited numbers, such as the Packard 904 Deluxe 8 Dietrich Convertible Victorias, of which only four were built. Dietrich Inc, which designed the bodies for six of the 904 Deluxe 8 Packards, was a business founded by Raymond H. Dietrich with the help of Edsel Ford and Fred Murray. Raymond Dietrich, who designed the ’32 Packard 904 Deluxe 8, also later designed the iconic Checker cab and the reverse Gibson Firebird solid-body electric guitar. Thanks for visiting Classic Cars Online US. 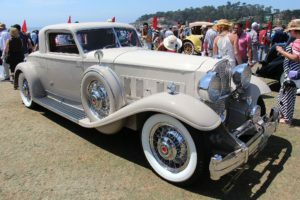 I hope you enjoyed this short article on the 1932 Model 904 Deluxe 8 Packard. Please browse around the site and be sure to visit the Classifieds page if you’re looking to buy or sell a classic car, parts, or related services. Part of the reason Classic Cars Online US exists is to help connect classic car buyers and sellers, and we’ve added several ways for you to connect, but first, be sure to visit the Classifieds page if you’re in the market to buy or sell classic cars such as the iconic Packard.